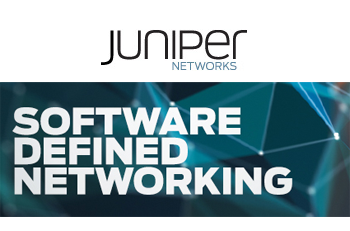 In what it described as a transformative step for the company and for the networking industry, Juniper Networks outlined a four-step roadmap to software-defined networking with the goal of improving automation and agility in data centers and across service provider networks. 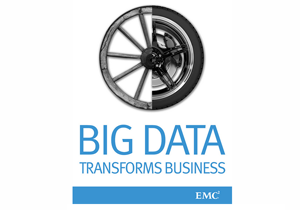 "SDN is a major shift in the networking industry. At Juniper, we think the impact of SDN will be much broader than others have suggested. It will redefine networking and create new winners and losers. We’re embracing SDN with clearly defined principles, a four-step roadmap to help customers adopt SDN within their business, and the networking industry’s first comprehensive software-centric business model," stated Bob Muglia, executive vice president, Software Solutions Division, Juniper Networks. Muglia said the Service Chain concept can satify a range of applications across the networking industry. Some examples include: (1) a cloud data center connection between the Internet and a web server, (2) between two components of a cloud application, such as between a web server and a middle-tier application VMs, and (3) the mobile service provider edge, where network traffic is coming from a cell phone tower, moving through an edge router and then to various systems where deeper processing occurs. Cleanly separate networking software into four layers (or planes) – management, services, control and forwarding – providing the architectural underpinning to optimize each plane within the network. In December 2012, Juniper Networks agreed to acquire Contrail Systems, a start-up developing software defined networking (SDN) solutions for approximately $176 million in cash and stock. Contrail Systems, which is based in Santa Clara, California, was founded in early 2012 was still in stealth mode at the time of the acquisition. Juniper was a strategic investor in the company. Contrail Systems is headed by Ankur Singla (CEO), who previously served as Chief Technology Officer and VP of Engineering at Aruba Networks. The Contrail team includes Dr. Kireeti Kompella (CTO), who was formerly CTO and Chief Architect, JunOS at Juniper; Pedro Marques,previously a developer of control applications for the Cluster Management Team at Google and before that a distinguished engineer at Cisco and Juniper; Harshad Nakil, previously at Aruba Fellow and also distinguished engineer at Juniper and Cisco; and others. In June 2012, Juniper Networks introduced a smaller version of its QFabric System aimed at mid-sized data centers. The QFabric architecture, which was first unveiled in February 2011 and began shipping in September 2011, collapses multilayer data center infrastructure into a single, any-to-any fabric that unifies networking, storage and cloud computing resources. The product set is composed of three components that create a high-performance, low latency fabric. The QF/Node acts as the distributed decision engine of the fabric; the QF/Interconnect is the high speed transport device; and the QF/Director delivers a common window, controlling all devices as one. The first implementation of QFabric scales to 6,000 network nodes, allowing any network interface within the network to connect to any other interface in a single hop. Juniper achieves this 6,000 port switching fabric by decoupling the line cards on the central fabric and moving them out into the network using dual-homed fiber connections. The entire 6,000 node network is a single switch and can be managed as such. 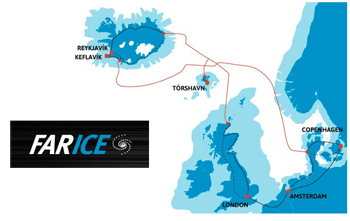 Farice, the main provider of international capacity from Iceland to mainland Europe, is upgrading the DANICE submarine cable system connecting Iceland with Denmark using Ciena's 40G coherent optical transport technology. The cable system implements Ciena’s GeoMesh networking solution to optimize the cable landing stations for seamless connectivity to terrestrial networks. The upgraded DANICE submarine cable consists of four fiber pairs giving a maximum capacity of 35.2 Tbps. Specifically, Farice is using Ciena’s 6500 Packet-Optical Platform for deployment on its 2,295 km long DANICE submarine cable system providing high-bandwidth connectivity between Landeyjar, Iceland and Blaabjerg, Denmark. The network will initially utilize Ciena’s 40G coherent transport technology, with ultra-long distance 100G wavelengths (based on the WaveLogic 3 coherent optical processors) to be deployed in 2013. 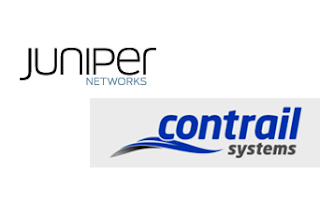 It will be managed by Ciena’s OneControl Unified Management System. Financial terms were not disclosed. In October 2012, Farice announced that BMW decided to move its HPC clusters to data centers in Iceland to take advantage of low cooling costs and renewable energy. Accuris Networks confirmed that AT&T Mobility is using its Wi-Fi offload and roaming solution to help its mobile users to automatically connect tot partner Wi-Fi hotspots in the UK. 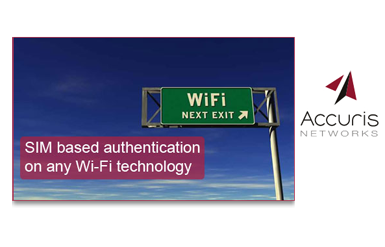 Accuris' AccuROAM isolution uses SIM-based account credentials to enable automatic authentication of users to Wi-Fi networks without the need to enter cumbersome usernames and passwords. AccuROAM enables any Wi-Fi to work as a full extension of GSM or CDMA networks for billing, policy, and authentication. Accuris Networks, which is based in Dublin, Ireland, said its solution enables carriers such as AT&T Mobility to deliver a best international roaming experience for its subscriber by providing easy access to partner Wi-Fi networks. These partner networks need only implement simple roaming rules on their access systems as AccuROAM authentication server is maintained by the mobile carrier. The system will support the forthcoming Hotspot 2.0. For the Wi-Fi operator, SIM-based authentication by roaming smartphones and other mobile devices provides an additional means of monetizing the network. “The AccuROAM platform gives subscribers automatic and secure access to Wi-Fi hotspots globally by using subscriber SIM credentials as the means of authentication. Accuris Networks is the only provider globally to provide this level of security and ease of access when connecting to Wi-Fi,” stated Larry Quinn Chairman of Accuris Networks. In November 2012, AT&T Mobility introduced discount roaming packages for calling and messaging, as well as new Wi-Fi capabilities, on select AT&T Data Global Add-On packages. Customers who subscribe to either the 300MB or 800MB Data Global Add-On package will now be able to use the AT&T Wi-Fi International app to access up to 1GB of Wi-Fi each month, at no additional charge, at select AT&T International Wi-Fi hotspots. SevOne,a start-up headquartered in Wilmington, Delaware, raised $150 million from Bain Capital to support its IT infrastructure management solutions. SevOne provides an monitoring and reporting solution for enterprises and service providers that uses peer-to-peer IT Performance Appliances to monitor and manage IT infrastructure of any size. The hardware-based appliances collect and store one year of raw performance data optimally without requiring aggregation. 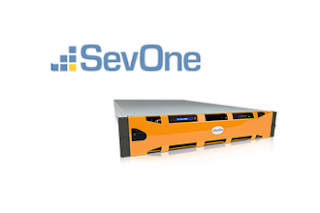 SevOne virtual appliances are also available running on on VMware. Multiple appliances are joined in a peering fabric to access information about the entire network. It supports NetFlow, IPFIX, sFlow, NetStream, and Juniper J-Flow. SevOne said it closed 2012 with its 6th consecutive year of record financial results. Pacific Crest Securities served as financial advisor. EMC is preparing to launch a "Syncplicity" cloud-based online file sharing service that gives customers the option to use either EMC Isilon scale-out NAS or EMC Atmos object-based storage. This enables on-premise storage in addition to the cloud. "The combination of Syncplicity and the Atmos cloud storage platform delivers a highly automated, enterprise-grade file sharing capability, where policies and performance follow data wherever it's accessed or shared without sacrificing security or control. As corporate users increasingly demand more mobility and access to files from multiple devices, EMC gives enterprises the tools they need to deliver new levels of productivity to their users," stated Chris Ratcliffe, Vice President of Marketing, EMC Advanced Storage Division. 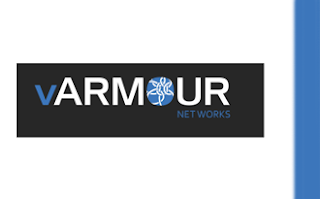 vArmour Networks, a start-up based in Santa Clara, California, $6 million in a Series A funding for its work in software-defined security for virtualized data centers. vArmour said its mission is to take virtualization into the realm of network security, pioneering a new kind of software-defined security (SDSec) that addresses the scalability, flexibility and cost challenges of current network security technologies. Product details have not yet been announced but vArmour said its SDSec solutions are currently in evaluation with large enterprises and service providers in the US and internationally. The funding round was led by Highland Capital Partners. This brings the company's total funding to $8 million since its founding in January 2011 by two NetScreen veterans. "We're extremely excited to join the Highland Capital Partners portfolio," said Roger Lian, co-founder and CEO of vArmour. "Corey and the Highland team have a clear understanding of how virtualization places new demands and opens new opportunities across the IT spectrum. With the benefit of their deep enterprise experience, and our new resources, we're in a great position to further build our team and launch our SDSec solutions into the market." EXFO introduced a Wideband Copper Test Module and a Wideband Copper and DSL Test Module for its FTB-1 handheld platform. The new test modules combine with the platform's built-in optical power meter, VFL and fiber inspection probe to create an all-in-one, all-at-once FTTN/hybrid network troubleshooting platform. 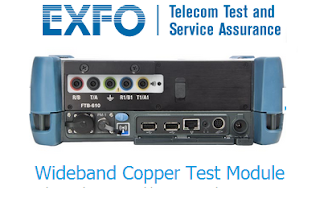 EXFO said the modules' feature sets are aligned with FTTN and VDSL2 requirements, and packed with not only traditional copper tests, but also advanced wideband, noise and fault location tests (e.g., TDR and RFL). The addition of copper and DSL test functionalities to the FTB-1, which also supports high-speed Ethernet, OTDR and iOLM testing. 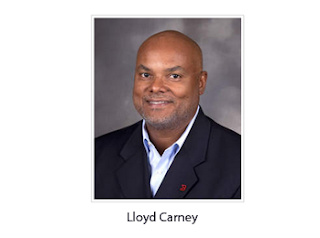 Brocade appointed Lloyd Carney as chief executive officer effective immediately, replacing Michael Klayko, who had announced his intention to step down last August, after serving as CEO since 2005. Most recently, Mr. Carney was CEO and member of the board of directors at Xsigo Systems, a privately held company specializing in data center virtualization. Previously, he was CEO of Micromuse, Inc., which specialized in network management software and later became an integral part of the IBM Tivoli framework. Carney has also held key senior leadership positions at Juniper Networks as its chief operating officer and at Nortel Networks as president of its Core IP, Wireless Internet and the Enterprise divisions. He also served at Bay Networks as the executive vice president and general manager of the Enterprise Business Group, the company's largest business unit. "I believe Brocade is poised to leverage its heritage of strong innovation and significantly disrupt the status quo in the data-networking industry," said Mr. Carney. "There are profound changes happening across high tech today and Brocade has a great opportunity to lead that transformation through differentiated products and customer focus. Success here will accelerate profitable growth for our company and drive further value for our shareholders. I am very excited and honored to lead Brocade at this time." Alvarion confirmed that its Wi-Fi base stations are currently being deployed in Tokyo to enable 3G data offload by one of Japan’s largest mobile operators. The Wi-Fi base stations will cover major train stations and congested areas in downtown Tokyo business districts, enabling the offload of heavy traffic from the 3G network. Hitachi Cable Networks is Alvarion’s partner in Japan. The companies said the project is the initial phase of a nationwide deployment targeting crowded public spaces where data usage is in high demand. "Alvarion’s Beamforming-based Wi-Fi solution allows us to provide our customer, a tier one mobile operator, the best coverage and capacity in challenging congested downtown areas, thus ensuring the highest quality of service to the end-user and a low cost of ownership," said Teruaki Tsutsui, President and Board Director, Hitachi Cable Networks. United Airlines launched satellite-based Wi-Fi Internet on its first of its international widebody aircraft. 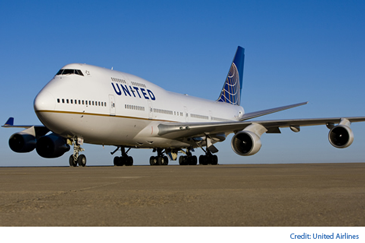 The initial deployment is on a Boeing 747 serving trans-Atlantic and trans-Pacific routes. The aircraft is outfitted with Panasonic Avionics Corporation's Ku-band satellite technology. United has also outfitted Ku-band satellite Wi-Fi on two Airbus 319 aircraft serving domestic routes and aims to to complete installation of satellite-based Wi-Fi on 300 mainline aircraft by the end of this year.